Stand-Up Overhead Projector Table w/Electric. 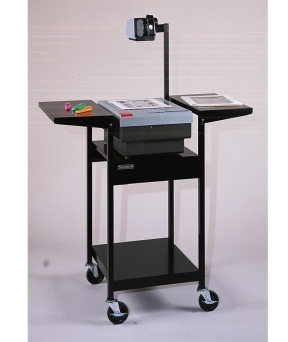 Stand-up overhead adjustable height projector table. Side shelves drop for easy mobility. Projector platform adjusts from 2"1/2 to 37"1/2. 4" Casters, two with brake. Complete with 3-outlet, 15' electric assembly. OHT39 39"	 20"1/2	 39"	 4"	 47 lbs.